Everyone knows Colorado is one of the best states to visit for a winter weekend getaway, but outdoor adventurers tend to hit the same spots in swarms—namely Vail and Aspen. Telluride has all the charm of a story book, but it can be challenging to get to. 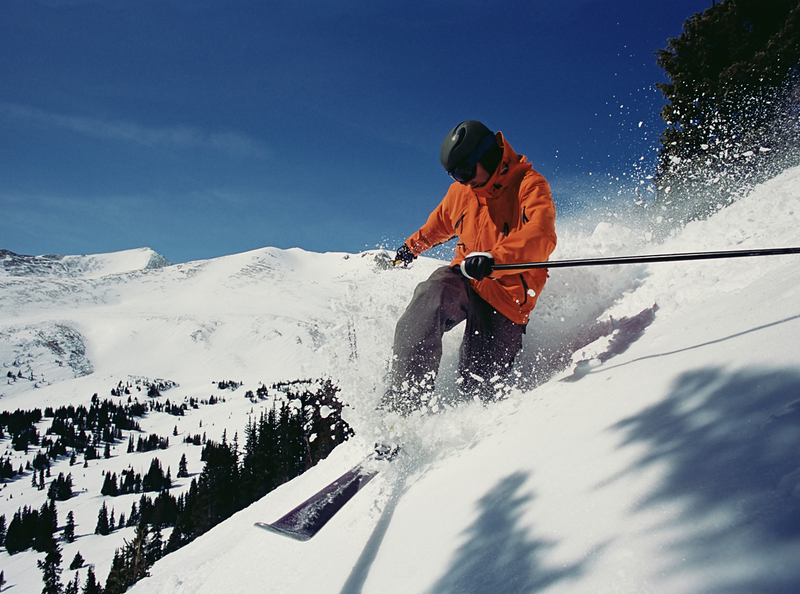 So, why not head to Breckenridge? With five skiing peaks (one of which tops out at 13,000 feet), there’s plenty of powder to explore for those who want to ski or snowboard. There’s also more than 50 miles of town trails open for snowshoeing, fat biking, and cross-country skiing. If staying inside is more your style (hey, the cold isn’t for everyone), Breck’s art district was ranked in the top spot on the 2017 Arts Vibrancy Index for small communities, meaning there are plenty of theater performances, art galleries, or crafting workshops to be found on these small streets. Here’s our long weekend guide to exploring all that Breckenridge has to offer. Fly into Denver International Airport, then decide if you want to rent a car. Breckenridge is a 100-mile journey (roughly two hours) from the airport. Once you’re in town, you won’t really need to drive, so we recommend booking the Epic Mountain Express shuttle. Once in Breck, you can use the Breckenridge Free Ride bus service (download the My Free Ride app for prompt updates on when exactly your bus will show up) and request a Lyft/Uber to bounce around town. If you want to be in the middle of all the mountain action, book a room at One Ski Hill Place, conveniently located at the base of Peak 8. For about $399 a night, you’ll not only have ski-in/ski-out access—you’re literally steps away from the BreckConnect Gondola that takes you up to four lifts or down into town—but you’ll also be able to relax in the indoor pools and hot tubs after a long day of activity, or challenge friends to a game at the private bowling alley. 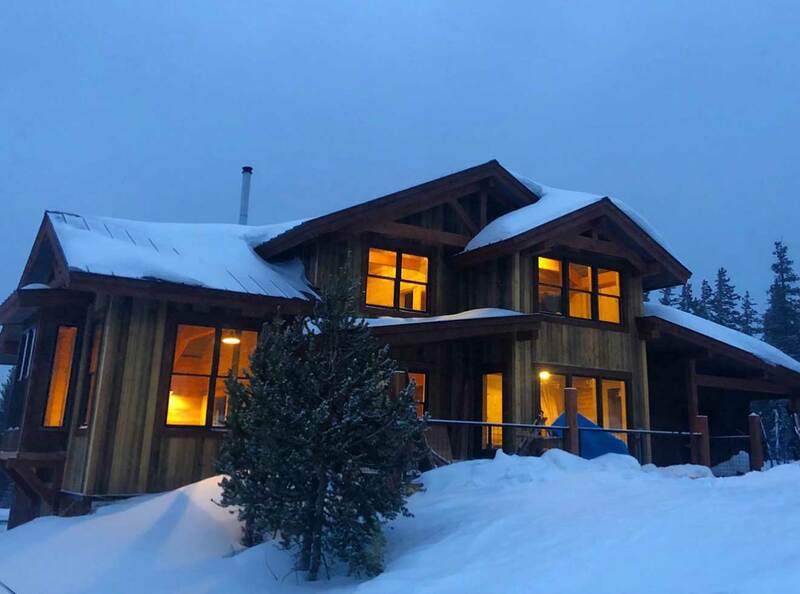 Those who crave more adventure should opt for the newly opened Sister’s Cabin, the first backcountry hut built on Summit County public lands in more than 20 years. The 2,090-square-foot cabin sits at 11,445 feet. You and your friends will have to hike, ski, or snowshoe to the front door. The trek is worth it: There’s a cozy wood-fired sauna waiting to warm you up post-workout. And if you don’t have your own skis or snowshoes, you can rent ‘em from Mountain Outfitters over on South Ridge Street. The cabin accommodates 14 guests, and goes for $50 per bed per night. Afternoon: Familiarize yourself with the area and ward off jet lag with a leisurely fat biking tour through town. 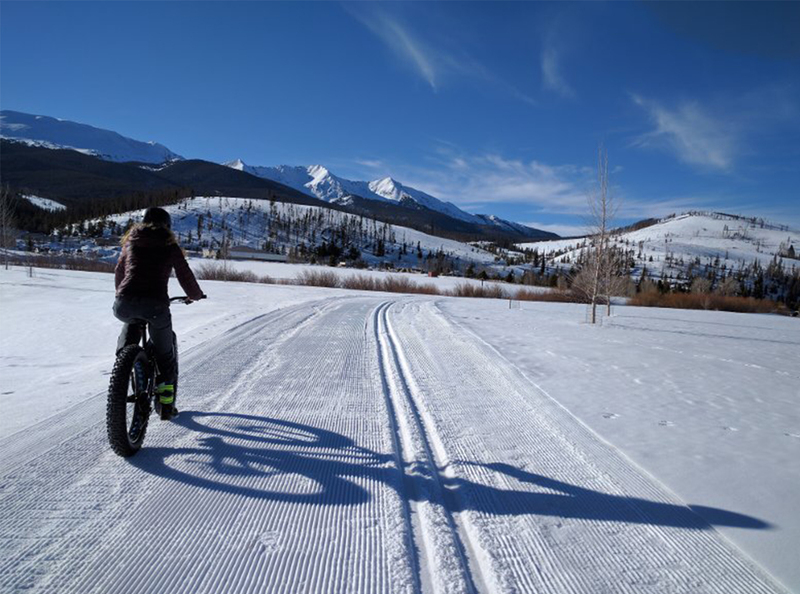 Sign up for Ridden’s winter beer and distillery tour and your guide will take you through the streets of Breckenridge, stopping to give interesting historical anecdotes of the old mining town along the way, before guiding you down snowy paths that deliver you right to Breckenridge Distillery’s doorstep. There you’ll take a tasting and tour the facilities to learn some of the secrets behind their award-winning vodka, gin, and bourbon. The tour and three-spirit tasting is complimentary, but if you hand over an extra $10, you can taste 10 varieties, including their spiced whiskey, espresso vodka, and spiced rum. From there you’ll make a bunny hop over to Broken Compass Brewing, where board games, darts, and 13 beers are waiting. (Their ginger pale ale and coconut porter come highly recommended.) A tasting flight is included in your Ridden tour, but this is where the riding ends, so feel free to stay and imbibe as much as your heart desires. The brewery promotes a free shuttle service that drops you off back in town, so no DD is required. Evening: Since Breckenridge is at a base altitude of 9,600 feet above sea level, take it easy for a night while your body adjusts to the altitude. There’s an impressive culinary boom happening (more than two dozen restaurants opened in the last year alone). One such place: Aurum. It’s a high-end option serving modern American cuisine with a laidback, come-in-your-jeans vibe. Standout dishes include the Colorado chicken roulade and honey spiced culver duck confit, though you’ll want to save room for dessert—their chocolate chip cookies are served with a unique milk jam that seriously can’t be missed. Morning: You can’t come to Breckenridge—especially during ski season—without some time on the mountain. With five distinct peaks, 11 bowls, and North America’s highest chairlift, trust when we say it’s worth your while, whether it’s your first time strapping into skis or you’re a seasoned pro. If it’s your first full day in town, Ski and Snowboard School guide Patrick Guilbert suggests sticking to trails below the tree line while your body continues to adjust to the altitude. (Though no one will tattle if you nab some of that high-alpine powder in the afternoon.) Heads up: Those renting equipment will want to wake up early, with a quick in-and-out fuel stop at Clint’s Bakery & Coffee House, as the lines for boots and gear can get long fast. Afternoon: After a warm shower, catch the local bus for happy hour over at The Gold Pan Saloon, a watering hole that’s been open since 1879 and allegedly has the longest continuous liquor license west of the Mississippi (meaning it’s seen plenty of gunfights and lasted through Prohibition). Be sure to play the ring toss game—anyone who rings the hook on their first try wins a free shot. PSA: Our restaurant will NOT be open for bar and food service today, Sept. 20. Distillery Retail and tours + tastings will be operating during normal hours and Main Street Tasting Room will remain open until 9PM. Morning: For advanced and expert skiers—meaning you aren’t looking for much instruction and can comfortably navigate black diamonds—the Breck Guides Go Beyond experience is worth the indulgent splurge. For $855 (that can be spent solo or split amongst 6 people), you’ll be partnered with the elites of the mountain’s Ski and Snowboard School—these guides have not only passed the standard PSIA/AASI Level III certification, but also an Avalanche Level I course and First Aid/CPR certification—and given special access to the ski patrol’s morning meeting, which grants you a behind-the-scenes look at avalanche control and how patrollers work with weather patterns to determine what terrain is best that day. You’ll also have access to first tracks, so you’re cutting through fresh pow before anyone else. Your guide will take you to all the best hidden stashes, easy-to-miss glade runs, and the most challenging terrain above the tree lines. Basically, you’ll head to après with major bragging rights. Afternoon: If skiing (or boarding) isn’t your style—or you simply don’t want to spend the entire day on the mountain, there’s good news: Breckenridge has way more to offer than just its on-mountain activities. 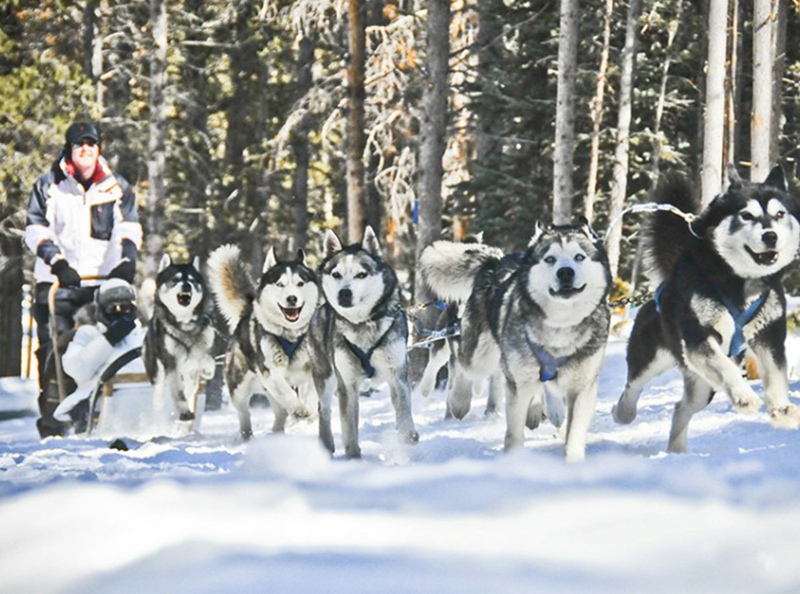 There’s the snowmobiling and dogsledding tours through Good Times Adventures (yes, you get to actually drive the dogsled), the snowcat tour with Breckenridge Nordic Center, and a variety of historical tours through the Breckenridge Heritage Alliance. Other local spots worth a visit: Breckenridge Brewery for their caliente burger and 10+ taps, and Breckenridge Creative Arts, where you can sign up for a metalsmithing or glassblowing workshop. Evening: Head to dinner at Sancho Tacos and Tequila, where the fried chicken, pork belly, and sweet potato tacos (not to mention any of the margs) offer some serious zing. Then, venture over to Mountain Time Escape Room, where you can choose from three interactive themes and try to break free before the clock runs out. Newbies should try the Boreas’ Revenge room, whereas pros should test their wits in their newest room, Paranormal Mystery. Morning: Wind down your trip with a relaxed sit-down breakfast at Columbine Cafe. The menu is one of the bigger ones in town, but you can’t go wrong with the corned beef hash or steak and eggs. If you’re in more of a rush, swing by Kava Cafe just one block down. Sure, you could choose from a limited selection of breakfast burritos and lattes, but locals visit this small shop for their hot-out-of-the-oil mini donuts tossed in maple brown, cinnamon, or powdered sugar. Afternoon: Breckenridge gets an average of nearly 30 feet of snowfall each year, and locals know how to make the most of every flake. 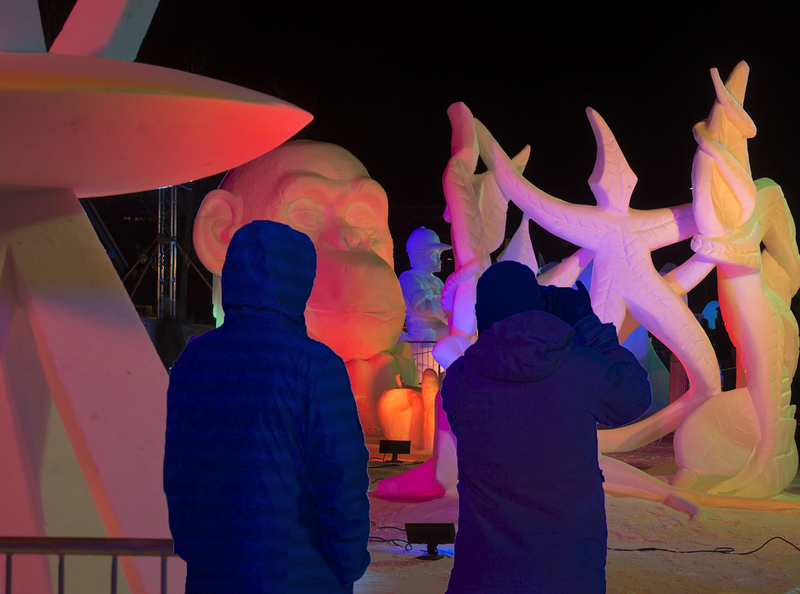 If you’re in town from January 21-25, you can watch 16 teams of four snow artists transform 25-ton blocks of snow into a walkable outdoor art gallery during the 29th annual International Snow Sculpture Championships. But if you can’t make it on those exact dates, don’t freak: the artwork—which is created in 65 hours across five days of competition—will remain up for display until January 30th.